We come again to speak with you about the underworld of transformation you are going through now. We are the collective soul voice of the one you know as Isis. She is in the matrix of your world and the world of nature. When one of the worlds dies, the other transforms as well. We come today to tell you of such a shift in the balance of worlds, and to help you understand what transformation means for you now, from a more cosmic, universal perspective than you might otherwise be able to count on as the days ahead begin to unfold. When worlds collapse, life continues. This is something that cannot be denied. Anep remembers the code and life assembles itself into perfect form on the plane of existence suited to that expression. Your present world is already in a state of collapse in many ways. The natural order has been altered to such an extent that putting it back into its proper state would force the pattern into total reconstruction. The act of regeneration requires some level of underworld penance, some coming to terms with the reality of the situation of life’s expression such that the soul can recognize the part it has played in the continuation of an illusory acrobatics of energies. When the soul’s embodied personality – that is you – comes to this point of realization, it triggers the instant dissolution of the world it had been operating within. Thus, an individual’s world dies, and the underworld journey begins. How much this is true for the individual is also true for the collective, and thus the world of human affairs has come to the brink of transformation as a whole. Have you put aside the illusions that have kept you in perfect ignorance of the truth of implied universal revelation? By this we mean, have you realized that, for all of your knowledge and accumulated understanding, you have not yet grasped totally the reality of what is set to reveal itself? When finally the masks of power fall from the faces of those who have lived out of balance with the rhythm and operative wholeness that Isis embodies, the moment will have arrived at which all may recognize a greater reality. Reality, at that moment, will die, and the reality which is and always has been will become more fully apparent – the underworld. We are parachuting into your awareness now so when that time comes, you may feel some sense of this underworld reality in a more familiar, fully aware way. There is no need to fear the underworld, for you have traveled through it before and put yourself willingly into a position to travel it again, by choosing to be born on Earth. You would not have made such a choice if you didn’t already know you would come through the experience in good condition. Now we come to the present moment. How is it to be that you will emerge through the transformation that is already underway without feeling like you will die? How will you have enough life within the whole of the world, as it goes through apparent expirations and extinctions real or imagined, to emerge with the integrity of knowledge of who you are, what you are creating, what you are becoming? We will tell you one secret of the time: You have only to look with the understanding that life as a whole, life as the breath of worlds and universes, is in the process of recalibrating its expression, and soon it will be apparent to all beings that no matter what, life continues. Your own form is merely a transitory state of expression. The life that animates it is eternally everywhere. 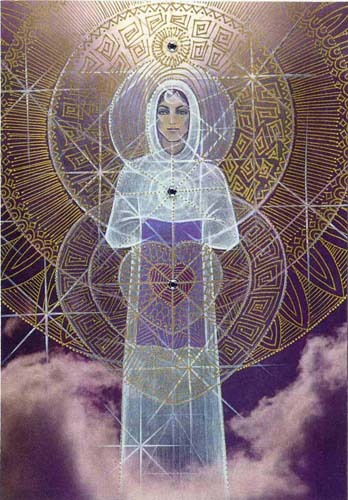 As life is, so is Isis, as the primordial nurturing aspect of love. Love is the nature of existence, and love is the matrix within and through which life lives in form and in formlessness, as you perceive it. When it is another time for life to express form in the context of your soul, you will know again the underworld journey is ready for you to travel it, and Isis will be there to guide your steps. As you continue on your reality exploration now, know that Isis is present with you. We hope our words serve you well until next we join our presence with yours.